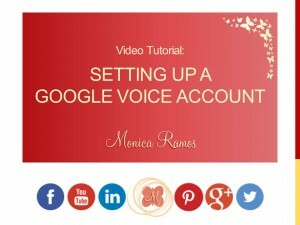 Google Voice is a great option for a business line. It offers you a FREE phone number in any area code. The phone number can be forwarded to any phone (even multiple phones) and if you do not answer the call goes to your Google Voice Mailbox you set up. The best thing about Google Voice is that it is free! This allows you to have a “business line” without giving out your actual mobile or home number. This is great for marketing materials, business cards, display banners, car decals, and public directories. You can set up your Google number to forward to your mobile number and have it display as a business call so you know how to answer. When you know it’s an incoming call from your Google number, you can answer with a professional greeting instead of just saying hello. However, when a regular call comes through you can answer that as you normally would. No need for a separate phone line. When you are not able to answer you can let the call go to voicemail where you have pre-recorded a professional business greeting. I would suggest stating your business hours in your greeting and perhaps your regular time for returning calls if you have one. When a caller leave a voice message, Google will translate it into text and send you a text message if you choose to activate this feature. The translation is not always perfect, but it gives you a general idea as to what the call is about so you can decide whether you want to call back right away or not. You will also get an email (optional setting) with a recording of the voice message as an attachment. You can also text from this number, either from the Google Voice account page online or via the Google Voice app. The app is free and I recommend getting it. Some of the other benefits of having a Google Voice number is that you can get numbers in different area codes, so if you wanted to do some advertising in another state, you could get an area code in that area. People might be more inclined to call a local number. Another great idea is to get a different phone number for each avenue of advertising you do–one number on the back of your car, one in the local paper, and another on your business cards. By doing this you can get a better idea of which advertising platforms are performing best, and which are not. For more tips like this, be sure to become a Fan on Facebook and subscribe to my Video Tips.